The Ravensberger Schmierstoffvertrieb GmbH (RAVENOL) develops, manufactures and markets high-quality lubricants since 1946, based in Germany. With seven decades of experience and expertise, RAVENOL has grown to become a major international player on the lubricant market and is now present in almost 80 countries worldwide. Our products are carefully developed to meet and exceed the requirements of the major automotive manufacturers and to comply with future regulations. Today, RAVENOL is one of the most dynamic and capable brands for premium lubricant products in the world. We aim to become one of the major high-quality lubricant providers all over Vietnam with our quality of service, quality of technology and quality of staff proving for all RAVENOL users. We offer the customer a wide range of lubricants and cleaning products, including motorbike, car and truck engine oils. See all our products on our product page. 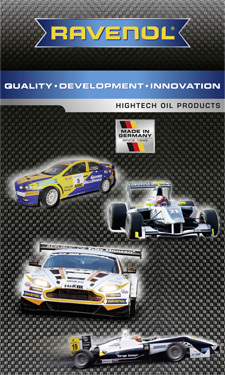 RAVENOL products carry the Approvals of many leading motor manufacturers such as Daimler Chrysler (MB), VW, BMW, Porsche, MAN, Scania, Volvo, MTU, Deutz, ZF, Steyr Motors, Cummins. RAVENOL products are API and NMMA listed. RAVENOL’s research & development team is renowned as one of the most technically innovative companies in the industry, and the high quality and optimal composition of RAVENOL products are the basis of their success. Extensive investment in laboratories, ongoing training of employees, who work closely with engine manufacturers, and not least the research and development partnerships in world motorsport, give RAVENOL this enviable reputation for innovation and technical excellence. One demonstration of this capability is the development of a special formulation for full synthetic oils based on esters. This system is offered under the brand name "CleanSynto" and offers exceptional protection to critical parts of the engine from premature wear.